Choosing the right sleeping bag for your needs is essential for comfort and in some cases, survival. Before purchasing a sleeping bag, keep in mind when and where you are most likely to use it. Will it be used for mild nights in the backyard or for sub-zero temperatures on a remote mountaintop? When you know what purpose your sleeping bag will be used for, there are several important factors that will help you compare among bags and choose the right one for your needs. Iqbal Wahhab. The Independent. Wednesday, 24 Apr 2019 10:58:00 GMT. Jerusalem Post. Monday, 15 Apr 2019 17:17:01 GMT. Most sleeping bags have temperature ratings that give a general idea of how well they insulate. This is a useful point of comparison, but the ratings do assume that you will use a ground pad. Temperature ratings include winter, three-season, and summer bags. Colder-rated sleeping bags are often good choices, because you can always unzip them if the weather is warmer than expected. If you have a three-season sleeping bag that you wish to use in cold weather, consider fitting an overbag around your sleeping bag for greater warmth. A sleeping bag liner can also add some warmth and protect your bag's interior surfaces from wear and tear. Loft and fill type are other important points of comparison. 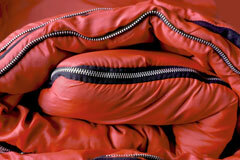 Loft refers to the thickness of a sleeping bag; it is an important factor when considering warmth. The fill used in sleeping bags has many qualities to be considered, including weight, compactness, durability, and warmth when wet. Common fill types include goose down, Hyperloft, PrimaLoft, and Hyperloft Lite. 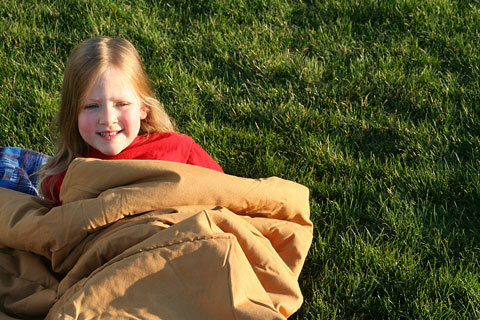 Goose down, the sleeping bag fill standard, is lightweight and an efficient insulator. It compresses well and lofts quickly when shaken. It can, however, lose insulation value if it gets wet, and it also dries slowly. Synthetic fills don't lose insulating value if they get wet, and they dry quickly. Sleeping bags with synthetic fill are usually cheaper than down-filled bags, but they tend to be heavier and larger than down-filled bags. Shape is also an important consideration when choosing a sleeping bag, and there are several specific shapes to choose from. A mummy bag narrows at the feet, flares at the shoulders, and tapers to a hood. It is designed to reduce weight and maximize heat retention with its close, narrow fit, but mummy bags can feel somewhat confining. A barrel bag is a bit bulkier than a mummy bag. It is slightly tapered and has an oval foot section. A rectangular bag is most practical for warm weather. It is the roomiest type of sleeping bag, and two rectangular bags can easily be zipped together to form a larger bag. While a rectangular sleeping bag is the least expensive choice, it may not be the most practical for a hiker, because it is bulky and does not provide much insulation. Choose an extra-long sleeping bag if you are over six feet tall. And, if you are a woman, you might want a bag that is designed for women. These bags are shorter, with a wider hip area and narrower shoulder size. Coleman - Features a broad selection of mild, moderate, and extreme weather sleeping bags as well as sleeping pads and accessories. Slumberjack - Learn about mummy bags, barrel bags, and rectangular bags. Browse sleeping bag products by temperature rating or shop by category. Kelty - Offers a broad selection of sleeping bags, liners, and accessories. The North Face - This outdoor gear and apparel maker offers down and synthetic fill bags in three comfort ranges. Western Mountaineering - Offers a series of lightweight, high quality down sleeping bags that are designed and constructed for durability. Marmot - Features a series of mummy-style down and synthetic fiber sleeping bags. Feathered Friends - This Washington-based firm offers a series of efficiently designed sleeping bags for backpackers and mountain climbers. Mountain Hardwear - Designs a range of quality sleeping bags featuring goose down and synthetic fills. Air Mattresses - often used under a sleeping bag to provide a cushioned sleep surface. Tents - often used above sleeping bags to provide protection from the elements. Down Comforters - sometimes used with a sleeping bag to provide extra warmth.